This antique Art Nouveau black bat vase was made in Japan. 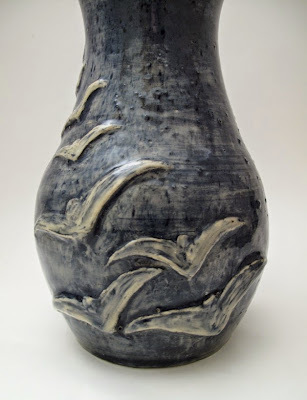 This bat vase is by a contemporary pottery company, Castle Rock Pottery. Here's their bat vase in red. They also create their bat vase in brown. This pottery bat vase was made in Australia in the 1940s. This unusual bat peach blossom statue isn't a vase, but I wanted to show it to you anyway. This Art Nouveau bat vase was made sometime around 1900 by Royal Copenhagen.